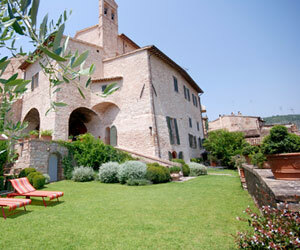 A charming townhouse in the town of Spello, a little village in Umbria not far from the famous town of Assisi. Spello belongs to "Borghi più belli d'Italia" (the most beautiful villages in Italy), an association that comprises only the towns that have succeeded in preserving their monuments and artistic masterpieces in perfect architectural harmony, along with a quality of life that can infuse a new rhythm and taste into our times. The town is built entirely from the pinkish limestone of the mountain it sits on: as the sun goes down the entire hamlet gleams with an extraordinary pink hue that gives a particular light to the houses clinging to the hillside, the roofs and the ancient walls. Surrounded by it's fortress walls, in its narrow lanes, baskets of flowers hanging off the windowsills and doorways, with characteristic tower houses and lively squares reminiscent of ancient times. Each May, the town celebrates the feast of the Infiorata where the streets are carpeted with pictures created by flowers. It is a remarkable event and draws tourists from around the world. This lovely little town has roots from Roman times, layered with Medieval and Renaissance architecture lending it to be one of the most romantic and charming villages in Italy. The town itself is a work of art, and this lovely little home has the same magical characteristics, it is a real gem and you will fall in love with this home and its town. The house started as a church built in the middle of the 1500's. The present owners have restored it to a warm and welcoming home. Reached from a small street winding through the town, your private gate leads into your private gardens with spectacular views of the valley stretched before you. You can relax midday in the garden or step outside and within a few meters, you come to the main square few where you can find many different shops and restaurants. The gate opens onto the private garden with a portico for shade and lawn chaises for sunning. Of course there is a table for alfresco dining! Open the door and walk into the spacious eat in kitchen with an open and large double living room with dining area. Here you have a satellite TV and Bang & Olufsen Round System stereo. Next to the living room is a king bedroom with TV, walk in closet and a beautiful antique fireplace. The en suite bathroom has a marble bathtub and shower. The picture window has pretty views of the garden. The staircase leads to the study, a split-level double bedroom suite is decorated in bright colors with a middle eastern theme. The bed is a double futon bed which is low to the ground. It also has TV and picture windows with views and an en suite bath. This bedroom is accessed from the garden and contains a double bedroom with TV and a small bathroom with shower. There is no internal entrance to the house from this bedroom. The Italian government has implemented an Accommodation Tax. The amount varies by municipality and ranges from E 1.50 – E 5.00 per person, per day and applies to all overnight stays for the first seven to ten days. Since you are in the village, the car can be brought to the house to drop off luggage but must be parked in one of the free parking lots around the edge of town. There is one covered garage parking space for an additional charge of 70 euro per week. Arrival dinners are not possible, but reservations at a nearby restaurant can be made on your behalf.